THE VERDICT: The bread is very dense, moist, and has a rich molasses flavor. It's really delicious with a nice big pat of butter on it and eaten along with the traditional baked beans, or really just about anything. 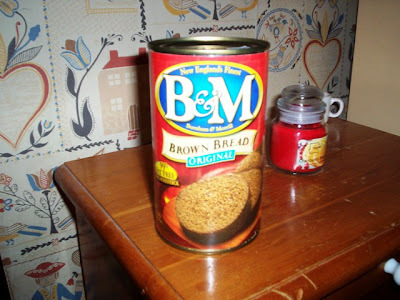 One of the best parts about this bread is that when you open the can, all you have to do next is slice and eat! The bread is really tasty, and when Mom was a kid, she used to have a couple of slices of brown bread with a bowl of tomato soup. Eating this really brings back memories for her! The next time you're in the supermarket, do yourself a favor and pick up a can. The cans are located next to the baked beans. I'm sure you won't be disappointed.